Cat got your tongue? If we’re referring to one of these felines, dear god, we hope not! Pop culture has gifted us with plenty of adorable kittens — Puss in Boots‘ Puss in Boots, Breakfast at Tiffany’s Cat, and Drag Me to Hell‘s poor doomed kitten — but movies and television have delivered fewer LOLcats and more WTFcats. 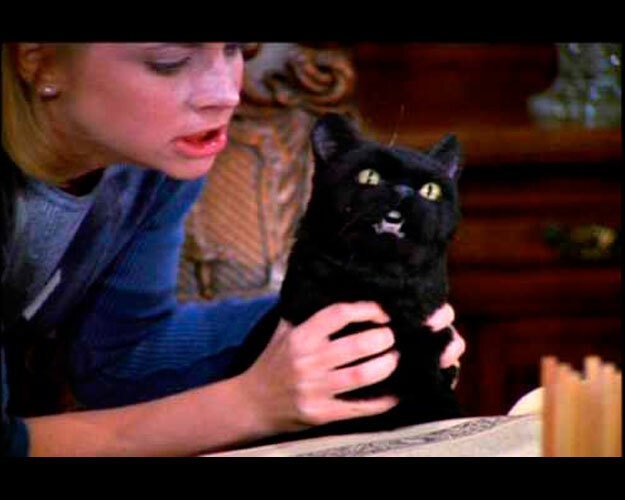 CatDog, Mr. Bigglesworth, and Sabrina the Teenage Witch‘s warlock-turned-kitty with a penchant for punnery, Salem (pictured here) — these are all felines that creep us out just as much as they confuse us. In honor of the Halloween season, click below to see 15 creepy pop culture cats. You’ll never say, “Here, kitty, kitty!” again. Worst Teen Mistakes Made in Movies—’Clueless’ and More! Exclusive New ‘Twilight: Breaking Dawn’ Trailer!